See our New Expanded Catalog of Garden Tools and Supplies! It's fascinating to see all the unique Garden Tools and strategies people have created over the years to control weeds, remove weeds, poison weeds, burn weeds, and so on. 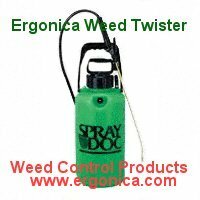 Ergonica has also invented a new weed puller called the WEED TWISTER that does an excellent job of pulling out individual weeds in tight spaces. Many of the tools listed here are especially suitable for children, adults, seniors and the physically challenged. Here you will also find Organic Herbicides and Weed Control Barriers and Mulches. Many of these special tools place Weed Control right in your hands! As you will see below, the usual places to buy tools -- your local hardware store or blasted on TV -- often bypass many of the more interesting and unique tools available. Since they are hard to find, these tools also make interesting collectible items, especially since garden tools are hot on eBay and local swap meets. Judging from the multiple "twisting" type tools presented on this page from various manufacturers, the "weed twister" concept is alive and well! Beyond the two weed twisters you see here, you may have also seen TV commercials for the Garden Claw, which is a twisting cultivating tool, and a motorized D-WeeD-R which is shaped like a long screw-driver with a short cross-bar. 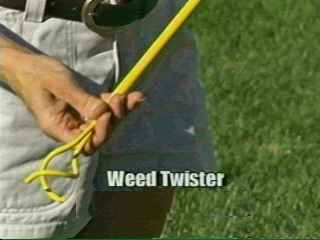 The Ergonica WEED TWISTER was also briefly televised in Florida. However, because of the high cost of television spots, the television campaign was halted in order to keep the price down for the benefit of the consumer. For comparison information between the Ergonica WEED TWISTER and other Weed Twisters, as well as other long-handled weeding tools for gardeners and farmers, see the Weeder Features page. Whether you're killing weeds or "grooming misplaced plants," the tool you select could help you get the job done more successfully and efficiently. The consumer information and guides provided on several of these links as well as on the Weeder Features page, will help you chose the tool that's right for you. For agriculture applications, please see the White Paper On the Weed Twister and Other Alternatives to Precise Hand Weeding in Agricultural Applications. As suggested in Groom Your Garden, your attitude and philosophy could make the difference between an arduous task or an artful experience. The use of chemicals to control pests and weeds must be handled responsibly. We strongly encourage non-toxic pesticides and alternative solutions wherever possible. We include information about TrueGreen and Terminix for your convenience and with the expectation that your use of their products will be with the utmost care. An excellent source of information about alternatives to pesticides is the Northwest Coalition for Alternatives to Pesticides. Great prices for 25 Top Selling Manual Weeders and other tools at Amazon.com. On this page probably the largest selection of weed pullers and weed killing hand tools on the Web, including several popular Weed Twisters! Although Ergonica is affiliated with several garden tool purveyors, we list many affiliated and non-affiliated resources with unique solutions to ...Arm Yourself With the Right Ergonomic Hand Tools, Organic Herbicides and Weed Barriers For Seasonal Weed Control! What kinds of Weeding Tools do You need? Are you a Weeding Tool Expert? Just TWIST - no need to pound, dig, pull or push with your hands or feet. Unique Coiled Tines efficiently penetrate the soil - deeper than any hoe. Easy reach into narrow corners or beneath shrubs. Weeds remain in the coil for easy removal. With a very precise coil width of less than 2 inches, and lengths from 36 to 54 inches from handle to tip, this heavy-duty tool is designed to protect cash crops, precious lawns and flowerbeds with a minimum of collateral damage and effort. For smaller seedlings, use it like a quick-action circle hoe. Let your drill do the twisting with the Turbo Weed Twister! The cone shaped Root Trap cuts off branch roots, grabs the tap root and compacts the soil into a cone shaped plug that can be pulled up root and all. Tool length 33 inches. What kinds of garden weeding tools do You need? 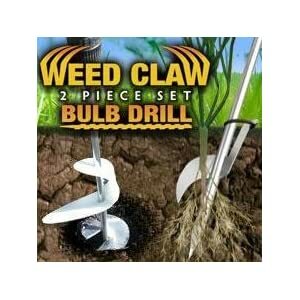 Weed Claw & Bulb Drill lets you Point, Press, and Spin your way to a weed free lawn. The Stainless Steel Weed Claw helps you get rid of your lawn weeds once and for all. Let your drill do all the hard work. The Weed Claw is simple and easy to use. It saves time and saves you back. 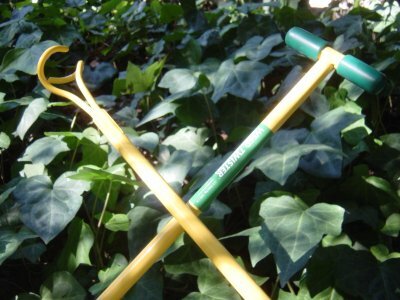 The weed claw works in all types of soil and is easy to clean and store. The Hexagonal shaped end improves tool performance. The Bulb Drill digs holes for bulbs and seedling planting. Mister Twister's Shear Magic is shear magic when it comes to keeping weeds, moss, lily pads, hydrilla, even fishing line off just about any trolling motor. By design, a trolling motor will pull your boat through the water until aquatic vegetation binds the prop. Mister Twister has found a way to solve this with Shear Magic. The Shear Magic's housing is made of UV protective Polypropylene. Ergonomically angled handle keeps the hand and wrist in a natural position, taking the strain and discomfort out of gardening. The stainless steel metal section helps prevent soil adhesion. The soft feel non-slip grip prevents the tools from turning in the hand, giving a firmer grip even in wet conditions. Set of 3 includes one each: trowel, cultivator, fork. If working on your knees isn't as easy as it used to be, give this adjustable garden seat a try. It takes the weight off your knees, while keeping your lower back properly aligned. The padded seat rotates back and forth as you reach out to plant or weed. The kneeling pads are cushioned for comfort, and the height and length can be adjusted to suit your frame. Peta Long Reach Garden Tools are specially designed for gardeners who have to sit on a chair or stool while gardening. It is strongly recommended that an interchangeable plug-in arm support is used with these tools which not only allows the strength of the forearm to be used but also acts as a counter balance. All metal parts are stainless steel and the grip is soft PVC vinyl. Long Reach Cultivator measures 32 in. long, weighs 18 oz. 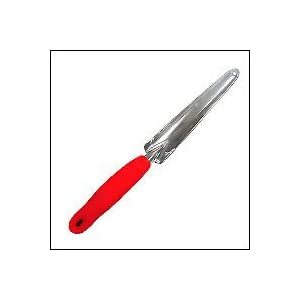 Long Reach Trowel measures 34 in. long, weighs 20 oz. Long Reach Hoe measures 31 in. long, weighs 20 oz. Long Reach Fork measures 32 in. long, weighs 18.5 oz. The cultivator is shown in the picture with the added arm support cuff. The Natural Way to Hold a Tool: Fist Grip Tools Are Easy To Use Because: -The unique handle design helps prevent injury to the hand and wrist, with a 'Natural Grip'. -All metal parts are made of 100 percent stainless steel. The advantage of stainless steel is that it does not rust, and slides easily through soil. 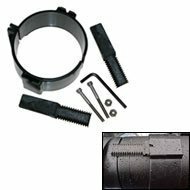 - Eash Fist Grip tool weighs about one half pound. A gentle downward push on the handle quickly pops out tenacious weeds. Even removes dandelion or chicory taproots. Stainless-steel head solidly connects to the ash handle, with a leather loop for hanging. Crafted exclusively for us. 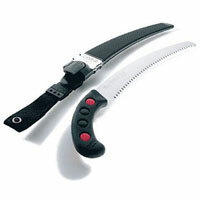 Measures 12" L.
Ideal for close weeding around plants or in raised beds. 12" handle and a 4.5" blade. Handle is riveted to shank. Limited lifetime warranty. Lifetime spring steel blade never needs sharpening. "If you can't eat it or enjoy it, maybe some other critter can?" Chrome plated with comfort wooden grip. Straight shank, 14in. notched weeder. Weight .4lbs. Hand Weeder "The path of mankind is an ugly scar on the face of nature." This rotary cultivator fluffs and aerates soil to encourage healthy root growth while at the same time knocking down weed seedlings. The handle is lightweight to minimize fatigue, and the aluminum wheels are study and rustproof. Remove one or more wheels to reach into tight spots. 63" L when handle is fully extended. Durable steel edger with ergonomic handle uses natural walking motion to cut a clean edge. Stainless steel blade with blade window for accurate positioning locks into upright position for easy storage. Great for sidewalks and curbs. This slim, sharp-tined tool is great for weeding in a tight area without damaging flowers. Multi-Star Interlocking Tool System. Premium quality hand saws created to meet the requirements of professionals who demanded the finest tools for each and every application. Transforms your garden into a weed-free zone. Thin, sharp blade clips roots just beneath the surface of the soil. Slim, pointed head gets close to existing plants without uprooting them. Innovative, no-mess design lets you just scoop waste up and into the bag. Bag clip allows for an efficient, sanitary method of replacing bags. Just hose off the scoop to clean it. "Weed tolerance is a virtue." Heavy duty extended reach weeder / cultivator crafted from forged steel. 4 5/8 x 1 5/8 blade. 17" long overall. 10" handle. Weight: .5 lb. Forged Handy Weeder "If it's in your way, maybe you shouldn't be there!" Tom: I've seen a Master Weed Twister use other tools for weeding, instead of just the Weed Twister. Does she lose her standing as a Master Weed Twister when she uses different weeders? Dr. Yucca: The Master Weed Twister knows which tool is best for each weed and situation, depending on such factors as the soil condition, length of roots, type of roots, and proximity to other plants that need to be protected, for example. She will cunningly use the hoe in open areas when the weeds have shallow roots and there are no other plants to protect nearby. She will wisely pull out the precise Weed Twister to use like a circle hoe in narrow places between favored plants or to twist out a weed with larger roots. Tom: How can one know the length of roots when you can't see below the surface of the soil? If you have a field to clear, then the Seymour weed scythe may be just what you're looking for. This high-quality 24-inch scythe is handmade from the best Austrian steel. The rugged, heat-treated tang stays sharp longer. This tool offers an environmentally friendly way to clear weeds and grass by hand. Hand Tools, Power Tools, Garden Tools...find them all at CornerHardware.com! Constructed of a durable, dark green vinyl coated poly mesh fabric and edged with black acrylic binding to prevent raveling. #2 brass grommets are positioned on the top and bottom evenly spaced at 16" on center, which is standard for most wall studs. 8 deep pockets for storing those long handled tools, such as rakes, shovels, brooms, and/or mops. There are also 8 smaller pockets for storing those short handled garden tools such as spades, trowels, and hand clippers. 4 quick release buckles and straps, positioned on each top corner of unit for storing extension cords, garden hoses, and weed eater twine and 2 on center bottom of unit for holding that weed eater in place or any other tool available.